Joe Heitz was destined for a career in wine, even if he did not always know it. He was one of those people that destiny took a hold of. Joseph Heitz began taking an interest in the wine business during World War II. Needing money, he found a part-time job with Italian Swiss Colony wines a survivor of prohibition that specialized in packaging, lower, priced wines. From there, Joe Heitz earned a bachelor’s and master’s degree in winemaking from UC Davis. Armed with his new education, he was quickly hired by Gallo. His next job was at Beaulieu Vineyards where he worked with the already, legendary, Andre Tchelistcheff. At first, Heitz thought he might one day replace the aging Tchelistcheff, but that was not in the cards, so Joe Heitz went into business on his own, founding Heitz Winery. The debut vintage for Heitz Cellars was made from the 1959 vintage. The wine was made from purchased fruit. The wine was labeled as Cabernet Sauvignon. 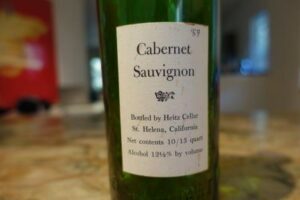 By labeled, I mean there was a simple sticker that read, Cabernet Sauvignon, bottled by Heitz Cellar, St. Helena California. The vintage was written by a. After his first vintage, there was no turning back for Joe Heitz. 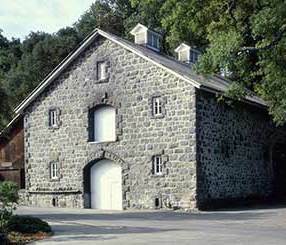 The last remnants of the original winery are used as the tasting room for Heitz Cellar. At the time, the vineyard was planted to Grignolino. In fact, Heitz Cellar stills makes a Grignolino, in honor of their first purchase. At this point, it is interesting to note, that while Heitz Cellar wines are most often associated with Cabernet Sauvignon, his first success was with Chardonnay. Joe Heitz was known to be a big fan of Montrachet. To help build his fledgling business, Joe Heitz purchased wines in bulk from other producers, bottling the wine under his own name. That explains why Heitz Cellar sold so much Pinot Noir in their early days. In 1964, Heitz Cellars purchased the Rossi Ranch vineyards. In 1965, Joe Heitz made the best deal of his life when he arranged to purchase the fruit from the 35 acre parcel of vines owned by Tom May and Martha May, dubbed Martha’s Vineyard. The following year, Heitz Cellar released their first vintage of Martha’s Vineyard. The 1966 bottling of Martha’s Vineyard is important, as this marks the first time a California winery began placing the name of the vineyard on their wine. Joe Heitz passed away in 2000. Heitz Cellar continued expanding their holdings with purchases and leasing arrangements. Their next major deal was to buy the fruit from the Bella Oaks Vineyard, which they used as a fruit source in 2007, when the vineyard was bought by the Staglin family. The Bella Oaks vineyard was a deal similar to Martha’s Vineyard, where Joe Heitz purchased the grapes, but did not own the vines. The Bella Oaks deal was a natural for Heitz, as the owners of Bella Oaks, Barney Rhodes and Belle Rhodes helped with the planting and vineyard work at Martha’s Vineyard. In April, 2018, it was announced that the legendary estate of Heitz Cellars was sold to Gaylon M. Lawrence Jr in a massive transaction. Gaylon M. Lawrence Jr is the head of a family business that has interests in banking, farming and agriculture. This is their first vineyard investment. Since those initial purchases, and other leasing agreements, Heitz Cellars now owns more than 1,100 acres of land in the Napa Valley! All of their vines are farmed with a self sustaining, organic approach. Heitz Cellars owns parcels in various appellations in the Napa Valley including, St. Helena, Rutherford, Valley Oak Ranch, Ink Grade Vineyard and Howell Mountain. Of their 1,100 acres of land, about 425 acres are currently cultivated with vines. Heitz Cellars has the latest release program of any producer in the Napa Valley. The wines are not sold until the estate thinks they are ready to drink, which is often 5, 6 or 7 years after the vintage. This unusual arrangement also allows Heitz Cellars to maintain a backlog of moderately, recent vintages. Heitz Cellar produces Cabernet Sauvignon, Sauvignon Blanc, Chardonnay, Grignolino, Zinfandel and Zinfandel Port. Their entire production is close to 40,000 cases of wine per year and about 25,000 cases of that wine are Cabernet Sauvignon. Heitz Cellar is best served at 15.5 degrees Celsius, 60 degrees Fahrenheit. The cool, almost cellar temperature gives the wine more freshness and lift. Young vintages can be decanted for 1-3 hours, depending on the character of the vintage. This allows the wine to soften and open its perfume. Older vintages might need very little decanting, just enough to remove the sediment. Heitz Cellar is best served with all types of classic meat dishes, veal, pork, beef, lamb, duck, game, roast chicken, ribs, hamburgers, barbecue, roasted, braised, grilled dishes and stews. Heitz Cellar is also good with Asian dishes, hearty fish courses like tuna, salmon, mushrooms and pasta. The white wine of Heitz Cellar is best served with all types of seafood and shellfish, sushi, sashimi, chicken, veal, pork and cheese. Medium bodied, with a fresh, medicinal cherry profile that ends with a blast of crisp cassis and cherry notes. Medium bodied, light in color, with a fresh, crisp, red berry and spicy profile that while fine, lacks weight and density. Tart, dry and tannic, with a medium bodied, bright red fruit, spice and earthy, red berry core. Secondary notes are already in the open, with their tobacco, earthy, spicy character. Medium bodied and tannic, this is an old school Cabernet Sauvignon with a tart, crisp, slightly dry finish. Herbaceous, leafy aromas, complicated by earth and bright red fruits, the wine is medium bodied with a crisp, somewhat drying finish. Light in color, medium/full bodied, dominated by juicy, ripe, crunchy berries, tobacco, spice and earth, with time hopefully, this will put on weight and flesh out. High toned, with bright red fruit, earth and tobacco. Medium bodied with a short, tannic, tart, red cherry finish. What this lack for in concentration, it more than makes up for with its tell-tale mint, menthol and eucalyptus scents that enhance the fresh ripe cherries. The wine is soft, smooth and drinking in prime time today. Medium bodied, soft, slightly more than full mature, the wine is starting to lose its fruit and gain in notes of herbs, mint, tartness and acidity. I’d drink this sooner than later if I owned any. Classic California Cabernet Sauvignon that provides great drinking today. If this was blind I would have guessed it was at lest 10-15 years younger than its true age. Slightly rustic, with some green, (olive, herb & mint) the wine still delivers a blast of blackberry, spice, earth and cedar that lingers. I liked this wine a lot! A perfect example of a fully mature, charming, California Cabernet Sauvignon filled with sweet, ripe cherries, tobacco, earth, smoke and spice. Popped and poured, the wine improved in the glass, softening in texture and adding more nuances. Much better on the nost than the palate, with its tobacco, earth, cassis, blackberry and leafy aromatics. On the palate, the cassis and cranberry finish did not remain long enough to hold my attention. It was a treat to taste this older, classic California Cabernet Sauvignon, but if I owned it, I'd opt for drinking this much sooner than later. Great example of classic California Cabernet Sauvignon, the wine offers the perfect blend of rusticity and firm, elegant charm, tobacco, mint and black cherry perfume, and an earthy, sweet and slightly tart, cassis finish. There is no reason to wait on this any longer, as previous bottles offered more fruit and freshness. Combining mint with cassis, blackberry, earth, forest and tobacco made a compelling perfume. In the mouth, this mature, soft, plush wine covered your palate with fresh fruit. The roasted fruit sensations linger in your mouth. Just a beautiful wine, with its unique, herb, mint, eucalyptus, cherry pipe tobacco and earthy profile. At 45 years of age, this was just showing great. Much better than the previous bottle, tasted a few months ago. This showed a sweet, dark, red fruit profile, with a smoky, tobacco, herb and bright cherry character, and a nice balancing act between refined rusticity and elegance. This is not a wine for further aging. I find I am more often disappointed than thrilled with this legendary these days. Hey, it's about to hit its 40th birthday. Nothing lasts forever. The nose is a ringer for a Left Bank Bordeaux, with its leafy tobacco, red berry , earthy, kirsch laden charm. Medium/full bodied, elegant, soft and with a sweet red fruit and just a hint of tart cherry in the finish. If you are sitting on a bottle, pop a cork. If you are thinking of buying it, personally, I do not think it is worth the money. Now, here's a wine I never thought I'd see again. The wine was showing beautifully. This bottle was clearly enjoyed perfect storage, because the earth, mint, smoke, tobacco, cherry and cigar box aromas were intoxicating. Fully mature, the earthy, cherry filled finish kept on going. Tobacco, blackberry, cassis, mint leaf, cigar box, spice and earthy notes open to a fully mature, soft, supple, round wine with elegant tannins. There is a lot of intensity, richness and balance in this sublime example of fully mature California Cabernet Sauvignon. Tasted blind, I was shocked to find this was close to 40 years old! This bottle was better than the last bottle I tasted. But they pale next to how this wine tasted a few years ago. Probably not a correct bottle. Cassis, tobacco and earthy scents were easy to find, However, there was no sensation of mint and hints of musty aromatics were present. Dense cassis flavors made up the finish. Sadly, I’m still waiting to taste an epiphany bottle from this legendary California Cabernet. Tobacco, cassis, earth, medium bodied and offering cassis with cranberry flavors, this was past its prime. Drink up. Not quite at the level of the previous bottle tasted a few years back, but still stunning, the wine is long, concentrated, fresh, lively and filled with deep red fruits, chocolate mint, herbs, forest leaf and tobacco. There is depth and length, which is perfect, because you want this beauty to stick with you. Definitely the first time I've ever seen this bottle, and probably the last, this was stunning in ever sense of the word! With good color, the floral, chocolate mint, cherry, tobacco and earthy nose got you going and kept you going as well. Full bodied, fresh, deep and long, the fruit had a beautiful sense of purity. This was stunning in every sense of the word! This is definitely one of the best, mature, classic, California Cabernet Sauvignon wines I've ever tasted! WOW!!! Fully mature, with a strong, tobacco, cedar, cigar box, floral and earthy character, which added to the bright, red fruits. Medium bodied, and still holding on to some sweetness in the fruit, the finish served up a hint of thyme, along with earthy, sweet and tart, red fruits. Stunning in every sense of the word, especially when the wine was revealed, as it was served double blind. I was sure it was a strong, fully mature Pauillac. Full bodied, with a good concentration of fruit, cedar wood, cigar box, cassis and wet earth, this can easily go another decade or longer. What a treat!